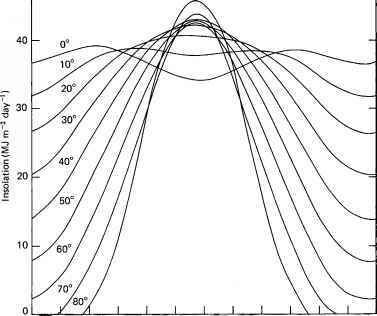 as a function of latitude. At the latitude of Canberra (35 ° S) for example, the corresponding solar elevations are 78.5 and 31.5 °: at the latitude of London (51.5 ° N) they are 62 and 15 °. The longest day is therefore 0.133cos—1 (—0.43377tang) h and the shortest day is 0.133cos—1 (0.43377tang)h.
With increasing latitude, the solar elevation at noon and therefore the maximum value of solar irradiance (Em) decrease, which in accordance with eqn 2.11, decreases the daily insolation. 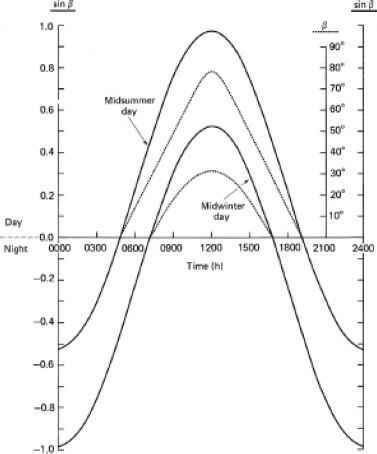 In the summer, however, this effect is counteracted by the increase in daylength (N in eqn 2.11) with increasing latitude, and the net result is that high-latitude regions can have a slightly greater daily insolation in midsummer than tropical regions. In the winter, of course, the high-latitude regions have shorter days (zero daylengths in the polar regions) as well as lower solar elevations, so their daily insolation is much less than at low latitudes. Throughout most of the year, in fact, the rule-of-thumb holds that the higher the latitude, the lower the daily insolation. 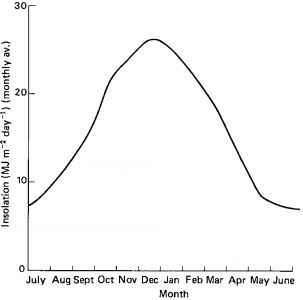 Figure 2.8 shows the change in daily insolation throughout the year, calculated ignoring atmospheric losses, for a range of latitudes. Figure 2.9 shows the true (measured) daily insolation as a function of time of year at a southern hemisphere site, near Canberra, Australia, averaged over a three-year period, illustrating the steady rise to a peak in the summer followed by a decline to the winter minimum. These data, unlike those in Fig. 2.8, include the effects of cloud and atmospheric haze. Fig. 2.8 Change in calculated daily insolation (ignoring the influence of the atmosphere) throughout the year at different latitudes in the northern hemisphere. The latitude is indicated above each curve. Plotted from data of Kondratyev (1954). Arabian Sea. After the winter minimum in December to January, Ed(PAR) rises to a spring maximum in March, April and May, and then declines to a minimum in June and July in response to increased cloud cover and aerosols associated with the onset of the southwest monsoon.30 Solar irradiance then rises to a second, lower, peak in September, following which it declines once again to the winter minimum. In more typical parts of the ocean, such as the North Atlantic, there is a single irradiance maximum, in the summer. To become available in the aquatic ecosystem, the solar radiation that has penetrated through the atmosphere must now find its way across the air-water interface. Some of it will be reflected back into the atmosphere. Fig. 2.9 Change in measured daily insolation throughout the year at the CSIRO Ginninderra Experiment Station, (35° S, 149° E). The curve corresponds to the daily average for each calendar month, averaged over the period 1978-80. Fig. 2.10 The mean interannual irradiance of PAR (Wm~2) at the sea surface for the entire Arabian Sea basin (excluding the Persian Gulf and the Red Sea) from 1979 to 1985. Plotted from data in Plate 4 of Arnone et al. (1998). J. Geophys. Res., 103, 7735-48. Fig. 2.11 Reflectance of water surface as a function of zenith angle of light (incident from above), at different wind speeds (data of Gordon, 1969; Austin, 1974a). The angle, 0w, in water is itself determined by 0a, and the refractive index, as we shall shortly see. The percentage reflectance from a flat water surface as a function of zenith angle is shown in Fig. 2.11, and in tabular form in Table 2.1. It will be noted that reflectance remains low, increasing only slowly, up to zenith angles of about 50 but rises very rapidly thereafter. Table 2.1 Reflectance of unpolarized light from aflat water surface. The values of reflectance have been calculated using eqns 2.16 and 2.19, assuming that the water has a refractive index of 1.33.
to give the best fit. Equation 2.18 predicts, for example, that whitecaps cover about 1% of the sea surface at a wind speed of 10 m s—1, and 13% at 25ms—1. Freshly formed whitecaps consist of many layers of bubbles, and have a reflectance of about 55%.1464,1284 They have, however, a lifetime of only 10 to 20 s in the ocean, and Koepke (1984) found that as they decay their reflectance decreases markedly due to thinning of the foam, and he estimated the effective reflectance to be on average only about 22%, and their contribution to total oceanic reflectance to be minor. Using eqn 2.18 we can calculate the additional ocean surface reflectance due to whitecaps to be only about 0.25% at a wind speed of 10m s—1, and ~3% at 25m s—1. Fig. 2.12 Refraction and reflection of light at air-water boundary. (a) A light beam incident from above is refracted downwards within the water: a small part of the beam is reflected upwards at the surface. (b) A light beam incident from below at a nadir angle of 40 ° is refracted away from the vertical as it passes through into the air: a small part of the beam is reflected downwards again at the water-air boundary. (c) A light beam incident from below at a nadir angle greater than 49 ° undergoes complete internal reflection at the water-air boundary. approximate assumption is made that the radiance is the same from all directions, then a reflectance of 6.6% for a flat water surface is obtained.636 For an incident radiance distribution such as might be obtained under an overcast sky, the reflectance is calculated to be about 5.2%.1074 Roughening of the surface by wind will lower reflectance for the diffuse light from a clear or an overcast sky. sin 0W na where nw and na are the refractive indices of water and air, respectively. The ratio of the refractive index of water to that of air is a function of temperature, salt concentration and the wavelength of the light in question. For our purposes a value of 1.33 for nw/na is close enough for both sea and fresh water at normal ambient temperatures and for light of any wavelength within the photosynthetic range. As Fig. 2.12 shows, the effect of refraction is to move the light closer to the vertical in the aquatic medium than it was in air. It will be noted that even light reaching the surface at grazing incidence (0a approaching 90 °) is refracted downwards so that 0W should not be greater than about 49 ° for a calm surface.